How much do you love your Adobo? 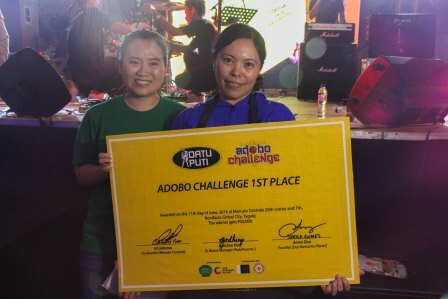 put Pinoys to task in finding and feting the best adobo recipes at the recent Datu Puti Adobo Challenge held last Saturday, June 11, at the Mercato Centrale food market in Bonifacio Global City, Taguig. Co-presented with Mercato Central and Our Awesome Planet, The Datu Puti Adobo Challenge was part of the thrust to take the Datu Puti Adobo Movement a step further this 2016. Launched in 2015, the Datu Puti Adobo Movement was created to push for Adobo to be our pambansang ulam. It is a movement that hits close to home because Adobo is a dish that is as personal, as it is national. Each household has its own signature Adobo, and the shared flavor defines families, identifies us as Filipinos, and boosts us as a nation. This event is also supported by partners Philippine Culinary Heritage Movement (PCHM) and the National Historical Commission of the Philippines (NHCP). The push for Adobo has reached much acclaim and has even been echoed by efforts in Congress. In fact, Bohol First District Representative Rene Relampagos filed House Bill 3926 in 2014, which sought to formally declare it as the national dish. The Datu Puti Adobo Movement has drawn support for the bill through a petition since the launching of the advocacy in June 2015. To get people more involved in the Datu Puti Adobo Movement this 2016, the advocacy group mounted the Datu Puti Adobo Challenge and gathered Mercato Centrale’s veteran home-based cooks to create their own special Adobo dish. Participating food vendors of Mercato Centrale prepared adobo dishes using any type of meat and vegetable, and were marinated in or cooked with at least two of the three main Datu Puti products: vinegar, soy sauce, and patis (fish sauce). The top 14 entries were selected based on various criteria, including: creativity of concept, which looks at the story behind the dish as well as originality, branding and cooking technique; innovation, noting the use of unique special ingredients and Datu Puti products; and Philippine culinary heritage, including how it adopts and represents regional cooking styles. Mercato Centrale was truly the right venue to celebrate this culinary heritage and mount the Datu Puti Adobo Challenge. The Mercato Centrale food fair is the go-to destination of urban foodies. Finding its home on 7th avenue and 25th street (across The Forum and in front of the “Between the Lines” art mural) in the heart of the BGC business district, this fab food fair happening every Friday and Saturday from 6 p.m. to 3 a.m. has earned the disctinction of being a hub of culinary experiences. It is a venue for both comfort food cravings and fresh gastronomic finds all prepped by budding food entrepreneurs. 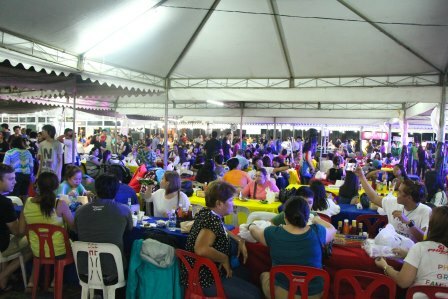 During the Datu Puti Adobo Challenge, some select Mercato vendors added Adobo to their usual fare, and the foodies were all in for awesome renditions of the national comfort fave. Hosted by a familiar foodie himself, Tonipet Gaba, the feast was made even more festive with musical performances by homegrown talents UpDharma Down and Ebe Dancel. 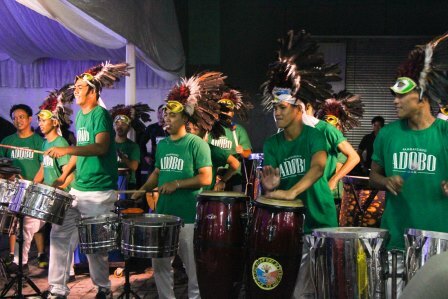 It was truly a treat to see both culinary and entertainment talents back up the Adobo initiative. As guests were treated to aromatic flavors and local OPM, Pinoy pride was truly in the air. Among the participants, the Top 3 among the entries wowed the crowd with their inspired versions of the dish. 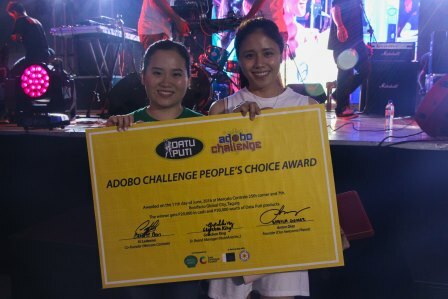 Based on criteria that took into account taste, presentation, story, and heart, three Mercato vendors were named as the winners of the Datu Puti Adobo Challenge. And based on on-the-spot voting by the Mercato foodies, one was hailed as the People’s Choice. Inspired by Cebu’s method of cooking lechon, The Oinkery roasts their pork meat inside a traditional pugon giving it that distinct smoky taste. Matthew combines the finished product with his sister’s Cebu-style adobo sauce and garnishes it with fresh green mangoes on the side. Having been slow-cooked for a total of eight hours, the meat is guaranteed to be soft and juicy with every bite. 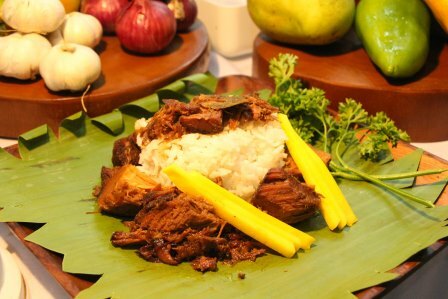 DESCRIPTION: Two Filipino favorites, Adobo and Laing, in one unique and flavorful dish. Pork Adobong Laing Pinangat – that’s two of the famous Filipino favorites, adobo and laing, combined in one extraordinary dish. Dayrit’s 40 years of experience in creating sumptuous heritage home-cooked meals is very evident with their entry for The Adobo Challenge 2016. According to Chef Miguel Dayrit, their version of the classic adobo recipe is different from the rest because it combines the strong flavors of two Pinoy viands to create an outstanding dish. This Bicolandia inspired concoction is a fusion of the creamy, hot and spicy and the sour and salty trademarks of laing and adobo respectively. DESCRIPTION: Classic Filipino adobo infused with Indonesian spices. Served with Sambal. Lucy of Bakmi Nyonya, one of the well-known food vendors in Mercato Centrale, reinvents the Pinoy classic adobo and incorporates her Indonesian-style of cooking to come up with a unique entry to the Adobo Challenge 2016. This delicate pork adobo treat is mixed with secret Indonesian spices, cooked in soy sauce and vinegar and served with the classic sambal. 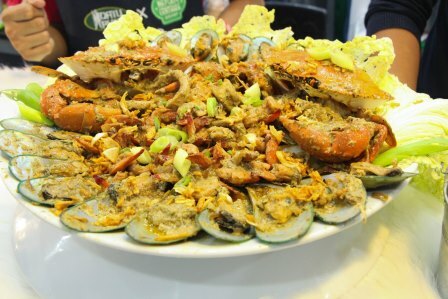 DESCRIPTION: A mix of crab, shrimp and mussels cooked adobo style and topped with cheese. Lariza’s, another well-known food vendor in Mercato Centrale shares their expertise in creating a unique dish for the Adobo Challenge 2016. Their very own “Seafood Adobo” is a mixture of mussels, prawns and crabs stirred in a mixture of vinegar and soy sauce, garlic, onion, pepper and finished off with cheese on top to add a creamy, tangy taste. Tess Gonzales, the proud owner of Lariza’s knew that her opponents would stick to the usual pork or chicken adobo, so she decided to come up with something edgy. With her “Seafood Adobo”, she hopes to motivate Filipinos to be more daring and “adobofy” fresh catch from the sea as an alternative to the usual adobo recipes. With these latest initiatives and the warm response of urban foodies, the Datu Puti Adobo Movement has definitely made strides in rallying more people behind the nation’s ulam of choice.